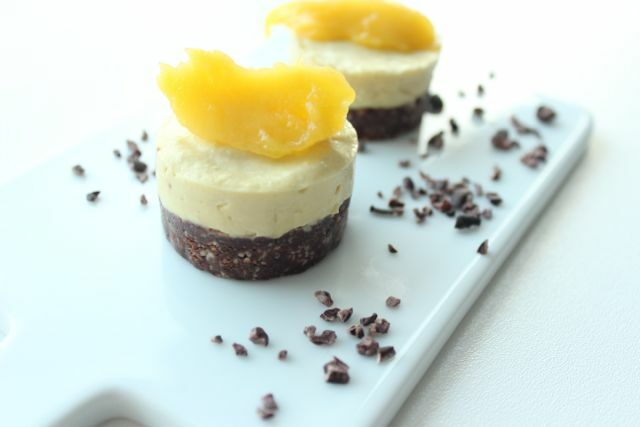 Raw mango tartlets – sugar free, vegan, gluten free and heavenly delicious! There are moments when I can’t believe how lucky I am! 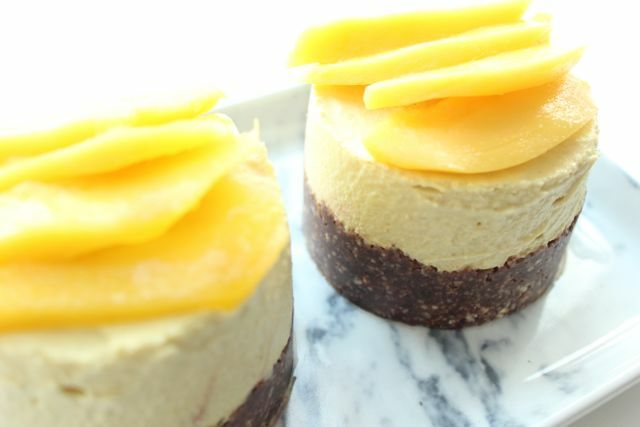 Last time I had one of these moments was, when I took these raw mango tartlets out of the freezer and a little later removed the dessert rings … Soo beautiful, whilst remaining healthy, gluten free, lactose free, vegan, raw, sugar free and then I took a bite and …. aaawww… so delicious! I made small (about 10 cm diameter) and very small tartlets (with round cookie cutters, about 3 cm in diameter). Since the tartlets are very high in energy, I think the small bites are actually totally perfect and I will from now on always make them in this size. Addditionally, the tiny tartlets look so pretty and make great gifts for friends! But enough text, here is the recipe for two raw mango tartlets (10 cm) or ten tiny tartlets (3cm)! First grind the nuts so that a coarse meal formes. 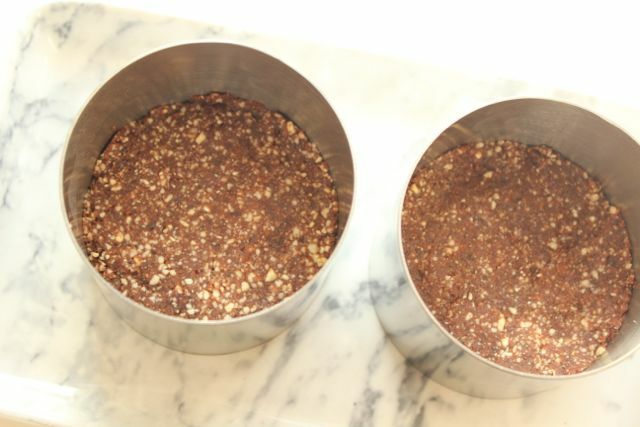 Then pitt the dates and place them in your blender, together with coconut oil, nuts and cacao and blend until a sticky mass is formed, which you can knead with your fingers. Put the mass in dessert rings (preferably on a plate) and press it down really firm, so that a base forms (about 1-2 cm high, see picture). Now we’ll proceed with the mango cream for the topping. Peel mango and cut the flesh from the core. Keep a little bit for the decoration and put the rest into the blender. Sieve the soaked cashews and add to the blender. 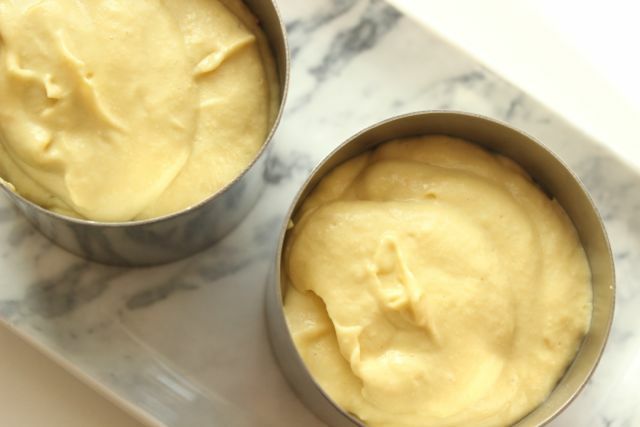 Add coconut butter, maple syrup and lemon juice and blend until a nice, velvety cream forms. Maybe add some more lemon juice or maple syrup, if you like. Now put the cream on top of the base into the dessert rings, and put everything into the freezer. Let it sit and freeze overnight. Get it out of the freezer approximately 15-40 minutes before serving (depending on the size of the tartlets), so they thaw slightly and you can easily remove the dessert rings. Decorate with some fresh mango and enjoy! The good news is that you can always put them back into the freezer so you can keep them for really long. Now have fun with my recipe and enjoy the beautiful little tartlets!